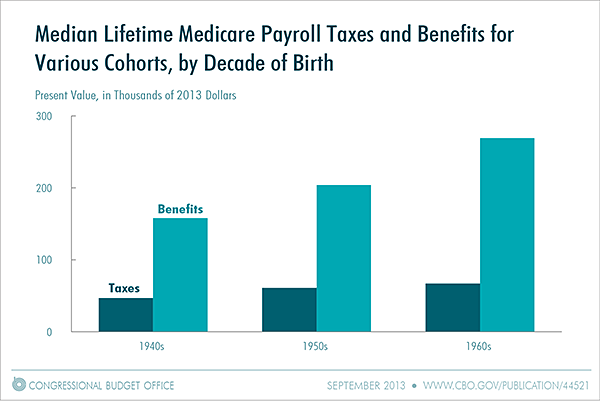 According to the CBO, benefits are projected to continue to grow for Medicare and Social Security and that means higher payroll taxes. The major health care programs and social security are likely to overtake all other components of spending by 2070 if no changes are made. By the CBO's calculations for Social Security, people born in the ‘40s, ‘50s, and 60’s are likely to pay more in than they get out. 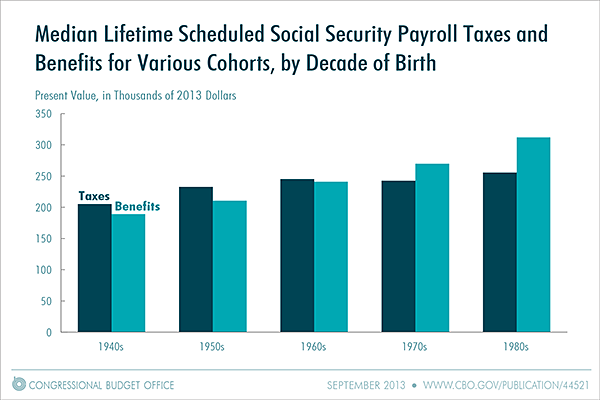 This is largely because “benefits for earlier generations were considerably larger than their payroll taxes.” Those in the ‘70s and ‘80s are projected to receive more than they paid into the program. As the system (and current tax and spending policy) is designed currently, it isn’t sustainable. Projections through 2038 show that the gap between spending and revenues will continue to grow under current law. The projections are likely generous as well, as current tax policy is likely to stifle growth and prevent the economy from meeting its projections. If entitlement reform doesn't happen, then payroll tax increases may end up as a part of the solution.